I can just imagine how many romantic relationships blossomed on Manila Bay. I remember, when I was new here in Manila, and that was around half-a-century ago, I still didn’t have too many friends from here and had a lot of free time on my own. 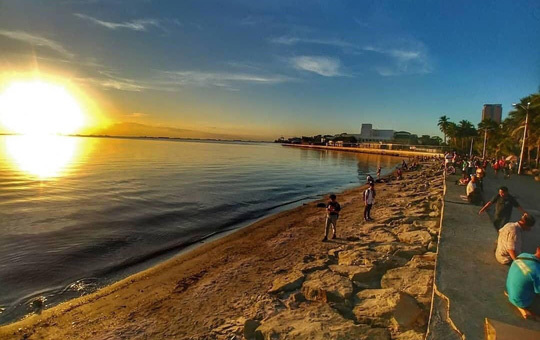 So on weekends, I would make it a point to spend my afternoons in Roxas Boulevard, walking from the US Embassy towards Aristocrat for my supper, enjoying the calming effect of the golden sunset on the placid waters of the bay, with the fresh sea breeze blowing from every which way. Sometimes, I would just sit on the seawall, watching some people maneuver their fishing rods, to catch what they probably would be having for supper. Of course, my mention of “fresh sea breeze” and “fishing” points to the fact that these could only have happened a very long time ago! The glorious sunset of Manila Bay is captured in this photo taken right after the January 27 cleanup drive. When I started to establish my career here in the big city, I began to notice the continuous desecration of what once was my favorite de-stressing hangout. The golden sunset was no longer glorious, as the view came with litter floating on the waters of the bay. The area near the Manila Yacht Club smelled like drainage clogged with human waste. Sadly, through the recent years, Manila Bay, to me, could only be appreciated from inside my car, as I drive along Roxas Boulevard to and from my residence. This way, the garbage on the water is not visible and the foul smell of drainage won’t bother me inside the air-conditioned vehicle. A disgrace to what was once the pride of Manila! Fast forward to the appointment of my friend, Bobby Joseph, as Commodore of the Manila Yacht Club. I was very happy to hear his first pronouncement—to help clean up Manila Bay. I found out that, as early as 2008, the Supreme Court had already ordered 13 government agencies to rehabilitate and preserve the Bay, but nothing has been done about it. The Boracay fiasco got several government agencies working 24/7 to meet our President’s deadline to clean up our world-famous beach destination within six months. Thank goodness to our President’s iron hand, finally, something has been done about the festering Boracay problem. Of course, the President’s instructions applied also to our other natural tourist attractions, but aside from news bits about solving similar drainage problems affecting El Nido and Bohol beaches, I didn’t hear of any move from any government agency to stop the continuous defilement of my erstwhile favorite de-stressing destination. If ever there was any, there was not much fanfare about it. That is why I was ecstatic when I read in the papers, shortly after Commodore Joseph’s declaration, that Department of Environment and Natural Resources Secretary Roy Cimatu immediately did an ocular, to determine the extent of work that has to be done to restore Manila Bay to its old glory. I was even happier to learn that the DENR now leads an inter-agency super body composed of the 13 government agencies, tapped to rehabilitate Manila Bay—Interior and Local Government, Tourism, Public Works and Highways, Metropolitan Manila Development Authority, Education, Agriculture, Health, Philippine Coast Guard, Budget and Management, Metropolitan Waterworks and Sewerage System, Philippine National Police, and Philippine Ports Authority. In fact, one recent weekend, January 27 to be exact, there was a “call for action” to further highlight the government’s resolve to finally do something to save the Bay, with a massive Luneta assembly of employees of the involved government agencies, civic groups, students, etc., and they later marched along Roxas Boulevard to dramatize their involvement in the cleanup drive. What’s even gratifying to hear is the snowball effect this long overdue move has created. I read the other day that even residents of CALABARZON have initiated the commendable act of restraining garbage from their area from flowing into our Bay. Hopefully, those in the other provinces will do the same. Large commercial establishments here in the metro have also volunteered to clean up the esteros that lead to the Bay, definitely a noteworthy undertaking! However, what is quite worrisome is the report I read just the other day. DILG Secretary Eduardo Año called a meeting of all mayors of towns and cities in Luzon that affect the Manila Bay watershed area. Four Metro Manila mayors did not attend, and some just sent their representatives. Could it be because a major factor that contributes to the pollution of the Bay are the informal settlers along the esteros, the same people who could deliver votes to these mayors in the upcoming midterm elections? 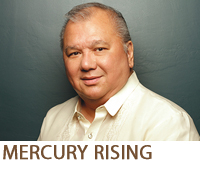 Although the Manila Bay cleanup drive started with a big bang, and the President has already approved the P47 billion budget for this project, the big question is—will it really succeed, considering the seemingly lukewarm support of some Metro Manila mayors? I’m keeping my fingers, my legs, and everything else crossed! This lackadaisical attitude of these officials who should have eagerly thrown in their full support to this cause is quite unsettling. Nevertheless, I am still grateful to my friend, Bobby Joseph for having been the “spark plug” for these rehabilitation efforts. A heartfelt handshake also to DENR Secretary Cimatu, DILG Secretary Año and DoT Secretary Romulo-Puyat for taking up the cudgels for the many of us saddened by the past administrations’ cruel neglect of this “national treasure.” Thank you all for this energized endeavor to save Manila Bay! 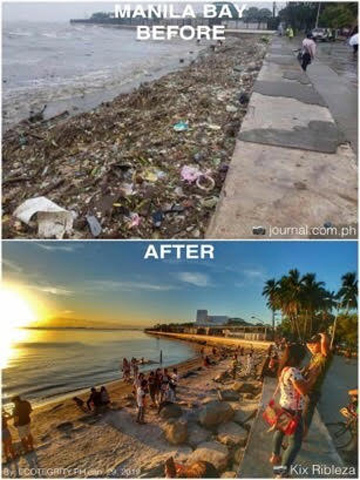 This shows the sharp contrast before and after the initial cleanup drive to further dramatize the work that has been done on Manila Bay so far. The effective radius of Wi-Fi is limited, but the effective radius of Wife-Eye is unlimited, and works even without power!